Nine amazing decades, 1926 to 2016. Nine decades in which a highway evolved into an icon; the Main Street of America, legendary Route 66, the Mother Road turns ninety next year and celebratory events are being discussed or planned in communities all along the Route 66 corridor. There is even going to be a European Route 66 festival in Germany next July, the first of its kind. Of course, the big event, the culmination of a year long series of celebrations, will be the one in November 2016 at the original western terminus of the highway in downtown Los Angeles. With development of the event spearheaded by Scott Piotrowski, the leading spokesman for the Route 66 corridor in that cities metropolitan area, it promises to be an historic extravaganza. In Kingman, the cities Route 66 association has been a bit slow in developing a website or social media presence but this is not indicative of it being just another well meaning organization with lofty goals and dreams. For such a small organization they are casting a fairly large shadow. The most ambitious project to date is development of the Celebrate 90 initiative that is a limited partnership with JuST Marketing of Kingman. The latest press release about the 15-month initiative will be added at the bottom of this mornings post. Meanwhile, the European Route 66 festival is shaping up to be quite an event. This link is for the tentative schedule page on the German Route 66 Association website. Driven by curiosity, I have to ask. How many American Route 66 enthusiasts have plans to attend? Aside from my involvement and Route 66 itself, the link between the festival in Germany and the Celebrate 90 events currently under development in Kingman are the Route 66 Association of Kingman’s ongoing endeavors to create a sense of community internationally. This initiative includes honorary memberships bestowed upon Route 66 associations, and plans for developing cooperative partnerships with these groups as well as neighboring communities and select organizations. On October 16, in addition to the wide array of other activities being planned for that weekend, the association will bestow membership on the Historic Electric Vehicle Foundation. In addition to the establishment of the Route 66 Electric Vehicle Museum, this organization has facilitated the contribution of electric vehicle charging stations for the Powerhouse Visitor Center (a project still under development), and works with groups such as the Route 66 Electric Car Club to foster development of Route 66 as an electric vehicle friendly highway. To date the Kingman association has extended this symbolic gesture of solidarity to the German, Japanese, and Dutch Route 66 Associations. 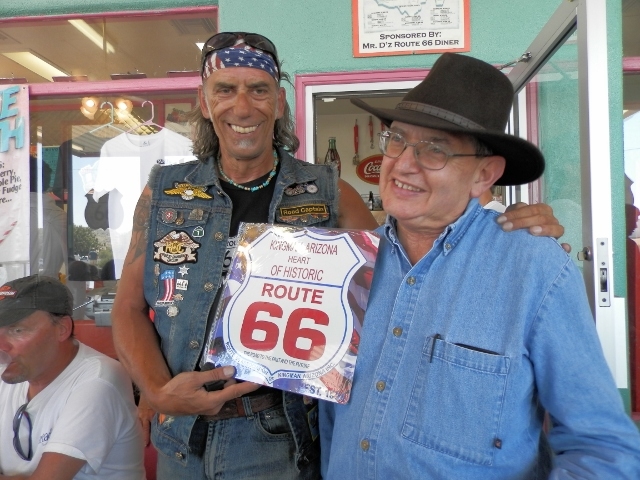 Next week they will add the Czech Route 66 Association when Zdnek Jurasek stops in Kingman with his tour group. As there isn’t a Route 66 association in Australia, the honorary membership was presented to Dale and Kristi-Anne Butel of Route 66 Tours as they are strong supporters of the Route 66 community, and exemplary spokespersons for the most famous highway in America. As the historic Dunton Motors facility, a property that was also an Edsel dealership, which dates to 1946 serves as the official headquarters for the association, the owners are making tremendous strides in making the facility a destination. Last week they unveiled the restored OK Used Car sign that graced the facility in about 1960. Powerhouse Visitor Center in Kingman. The Route 66 Association of Kingman is also partnering with Kingman Area Tourism and the Arizona Route 66 Association to host a reception and open house at the Powerhouse Visitor Center for the National Route 66 Motor Tour on October 16. 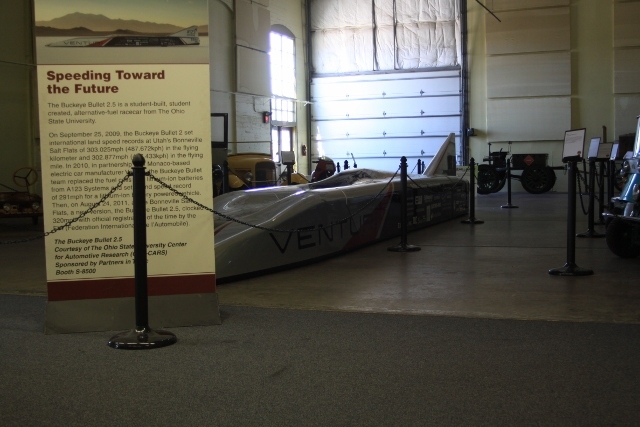 In addition to the static display of vehicles, that event will include special hours for the Route 66 Electric Vehicle Museum, a joint initiative between the Historic Electric Vehicle Foundation and Kingman Area Tourism that was recently profiled in an automotive magazine published in Madrid, Spain. It looks as though 2016 will be a most exciting year, and a wonderful way to kick off the countdown to the highways centennial. In Kingman, Celebrate 90 promises to provide locals and visitors alike with a string of fun filed weekends. In 2016, Route 66, the Main Street of America turns 90. To celebrate this milestone the Route 66 Association of Kingman, a 501c3 organization is spearheading a series of initiatives to build cooperative partnerships along the Route 66 corridor and to build on the theme of the 2014 Route 66 International Festival – Kingman: Crossroads of the Past & Future. The owners of the Dunton Motors Dream Machines complex built in 1946, which also serves as the office for the association has initiated numerous renovation projects for the historic dealership including the restoration and installation of a circa 1960 neon OK Used Car sign as part of the kick off for this 14 month program. For details pertaining to the Celebrate 90 initiative, membership information, event information, information about the associations’ monthly open house reception, or to make donations, please contact the Route 66 Association of Kingman.